And with a position open in LA, will he stay long enough to find out? A t a town hall meeting called to address a recent Mission District police shooting, Police Chief Bill Scott sat in the gym of Cesar Chavez Elementary, facing a crowd of more than 200 outraged community members. Another young man of color had been slain at the hands of police, and years of mounting animus needed to be directed at someone. That person was Scott. And it lasted for more than three hours. “You’re in the hot seat, Scott,” one community member said. And not only with the community. Just days before, Scott had “released” a rookie cop for fatally shooting a fleeing suspect in the Bayview. This time, the fury came not from the community, but from his own men: the San Francisco Police Officers Association, a group unhappy with an officer being released or fired. Scott’s entrance a little more than a year ago into the San Francisco Police Department was seen as a turning point for an embattled force of more than 2,000 sworn officers, its culture and seemingly absent sense of accountability. It was fresh off the heels of two independent reviews called in response to a number of controversial police shootings and two scandals involving bigoted and sexist text messages exchanged between officers (text messages that only came to light because of an investigation of corruption by officers in the department). Still, some wonder if Scott has been able to change much in San Francisco. And now there is also a question of whether he will be around long enough to make any real changes. On Wednesday, the Los Angeles Times reported that Scott was scheduled to be interviewed for Chief of the Los Angeles Police Department, where he served as a deputy chief before coming to San Francisco last January. Scott would not confirm the report Wednesday evening at City Hall — but he did not explicitly deny it. Others agree, and offered a look at how Scott has done so far. Mission Local spoke to nine policy experts, activists and police officers to determine whether Scott, now a year and four months into his tenure, has actually proven the department’s next step to reform. Scott, who was given a detailed list of questions, declined to comment for this article. Many applauded his horn-locking with the bellicose police union – which many consider a hindrance of reform – while others said Scott’s efforts have been too little, too late. More than anything, those observing Scott, from both inside and outside the organization, say the chief cannot reform the department alone – he needs the help of City Hall and, most of all, his own rank-and-file officers — the support of which some accuse Scott of not fostering. Moreover, some said the chief erred in keeping or promoting much of the same command staff from the days of Scott’s predecessor, Greg Suhr. “We’re just not seeing reforms on the streets,” Smith said. “They might be in a file drawer somewhere, maybe in someone’s head, but not on the streets. I mean, 99 shots?” he said referring to a recent police shooting in the Mission. 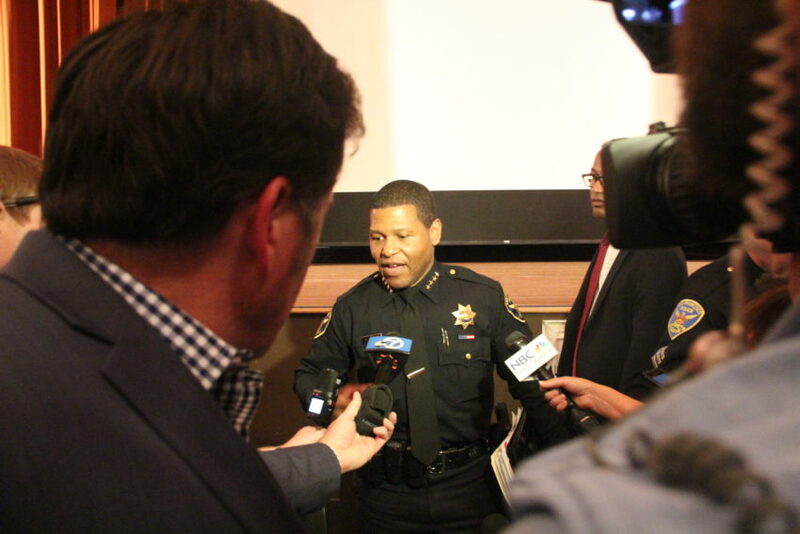 F or Chief Scott to truly set the department on the path to reform, he needs a new command staff, asserted two SFPD officers who asked for anonymity out of fear of retaliation — although both said it might be too late for that. Conversely, it’s unclear if the community’s recommendations are making their way to their chief. Many stakeholders complained that, after they gave their input, the policymaking undertaken by the department was opaque at best. The working groups are led by Scott’s command staff. Indeed, while some expected a shakeup of SFPD’s top brass following Scott’s swearing-in, the chief opted to either keep or promote many of the commanders who served under Suhr. Assistant chiefs Tony Chaplin and Hector Sainez, as well as deputy chiefs Mikail Ali and Denise Schmitt, were deputy chiefs under Suhr. Deputy Chief Michael Redmond remained in charge of the operation’s bureau, and Commander Robert Moser kept his place as head of the Investigations Bureau. Many others remained or were promoted. The officer further asserted that Scott has been largely siloed off from the rank-and-file officers — the very people he needs to follow him on his path to reform. And if he were to visit officers at the station level, he needs to do so without his command staff present, the officer said. Likewise, another officer described Scott as isolated from much of the department — that he and his command staff have not made serious efforts to reach down into the department. “He’s relying on (a staff) who’s not connected to rank-and-file to begin with,” the officer said, noting that neither of his assistant chiefs served as district captains. Moreover, that officer charged that Scott did not interview any of the command staff before keeping or promoting them. The officer said Scott did not vet the talent in the organization who would be willing to adopt his agenda. “How do you really know what’s going on in this place?” the officer said. The officer asserted, too, that Scott has canceled the last six monthly commissioned-ranked meetings — composed of mostly captains and lieutenants. Commissioned-ranked officers, the officer said, are responsible for setting the tone at each district station, and if Scott is not meeting with them regularly, how can he truly implement his new policies and create change? the officer asked. All three of the officers agreed that Scott cannot make lasting and meaningful changes in the department if he remains hidden behind a wall of deputies and commanders. S till, many stakeholders and policy experts in the collaborative reform process are reassured by Scott’s sword-crossing with the Police Officers Association. Last November, Scott decided to take his commanders — who are heavily involved in the reform effort — out of the union, which also has a say, via the contract negotiation process, on how policies are implemented. In February, the chief wrote a letter to the Department of Elections blasting the union’s decision to put a measure on the June ballot asking voters to approve tasers. This earned him the full and public wrath of Martin Halloran, the union president. In March, Scott fired Christopher Samayoa, a rookie cop who fatally shot an unarmed carjacking suspect in the Bayview last December — a move that also prompted barbs from the union. “This Chief has demonstrated his lack of care or concern for his officers on too many occasions and this latest misguided action will not go unanswered by the POA,” Halloran wrote. Barbara Attard, a long-time police accountability consultant who was an early member of the Office of Citizen Complaints, now the Department of Police Accountability, said she’s been impressed with Scott’s work on the reforms and standing up to the union. Anand Subramanian is a senior policy director at PolicyLink who led the Blue Ribbon Panel on Transparency, Accountability and Fairness in Law Enforcement, a report commissioned by the District Attorney that examined systemic bias in the SFPD. Scott, he said, has shown clear leadership on the policy side, citing his taking commanders out of the union, his opposition to Proposition H and his firing of Samayoa. “The POA does a good job convincing its membership that there’s no difference between members and POA as a political entity,” he said. To change culture, however, Subramanian said Scott needs to feel comfortable firing cops, even if the union fights back. That notion is crucial, says John Talbott, a business-development expert who sits on the bias and accountability working groups. He said using strict discipline on members who do not follow procedure is crucial for changing an organization, and Scott’s decision to fire Samayoa was an important step in underscoring the idea that there are consequences for failing to follow procedures. “If the union is going to fight you with high paid lawyers on anything you do like that, then you can see how they’re going to obstruct change,” he said. Halloran did not respond to requests for comment, but POA leadership has consistently denied that it is obstructing change. The union stated early on that it supported the DOJ reforms. Smith said that, although he is reassured by how Scott has dealt with the union, he could be even bolder. O n a recent Tuesday in room 551 in the Hall of Justice, Scott endured a barrage of questions under oath from POA lawyer Gregg Adam during an arbitration hearing on the department’s contract with the city. It was a rare public encounter between Scott and the union, which has been a fierce critic of Scott since his arrival. “Why do you think the POA should give up the ability of the members to have their voice heard in the (policy-making) process?” Adam asked, referring to a section in the contract that would limit the union’s ability to draw out the approval of policies related to the DOJ reforms. But Scott said he supported the provision — as, in the end, his own role as chief is implementing the DOJ reforms. Crew and Subramanian are both members of the so-called “No Justice, No Deal Coalition,” which is advocating for the contract to include language that limits the POA’s influence over the reforms. Both believe the city can support Scott and his mandate by supporting the provision — called “City Proposal 22,” which limits the time the union can request a so-called “meet-and-confer” sessions to deliberate over policies related to the federal reforms. The union would also have to waive its right to further deliberation if no agreement is reached following the deliberations. That wasn’t always the case. Mayor Mark Farrell initially supported the POA-authored Taser measure. Moreover, for a short period, Farrell shared an advisor, Nate Ballard, with the union, raising questions about how Farrell would steer the city during negotiations. Since then, however, the city has begun to show more support. Farrell withdrew his backing of the union’s Taser measure. The Human Resource Department, operating under the mayor’s office, added the proposal that limited the union’s ability to influence DOJ-related policies. “Assistant chiefs Tony Chaplin and Hector Sainez, as well as deputy chiefs Mikail Ali and Denise Schmitt, were deputy chiefs under Suhr.” It should be noted that Chaplin and Ali (a Muslim) are African American, Sainez is Hispanic and Schmitt is a lesbian. Coming in from out of town and demoting them might not have been a good move in minority sensitive San Francisco.